When it comes to investing in a junior mining company the one you thing can almost always be certain of is "uncertainty." Mining and especially exploration is and always has been a high risk business full of uncertainties. Those uncertainties and risks can range from everything from government politics to commodity prices and everything in between. From raising money to how that money is going to be spent, there is the uncertainty factor that never be avoided. One of the greatest risks or uncertainties though is the unknown. Prospecting in areas that have little to no past exploration records or data to go by. This is one of the reasons why so many smaller companies will tend to explore within areas that have some proven history and then explore within those areas that show a potential. Most countries today though have the bulk of their country's minerals catalogued. The more exploration over the years, the bigger that catalogue becomes. Modern day explorers just need to spend time researching the area of interest and narrow down through the data to get a fairly good idea of what the proposed area will offer. When it comes to countries that offer a decent proven history of mineral data along with the extraction of minerals, Mexico is one of the top contenders. After all, the mining of gold and silver has been going on here for centuries. Even long before the Spaniards arrived, the locals of that time were well aware of the mining of gold and silver. A person would almost think that with around 400 years of mining there would be very little in regards to minerals left to mine but it's almost the opposite. The silver mining industry has been thriving in the last few years, and investment in new projects has been continuing at a strong pace and Mexico has consolidated its position as the number one producer of the precious metal. What's even more is that Mexico today still offers the small junior a fighting chance to strike it rich with silver (and gold). The Sierra Madre mountains in Mexico, part of the same range that provides massive mineral wealth from the Andes in South America to the Rockies in the north, are still largely unexplored and other opportunities lie in wait for new entrants to the industry. Other companies are opening up old mines as the advancing state of mining technology allows companies to reassess ore grades and left-over tailings deposits. 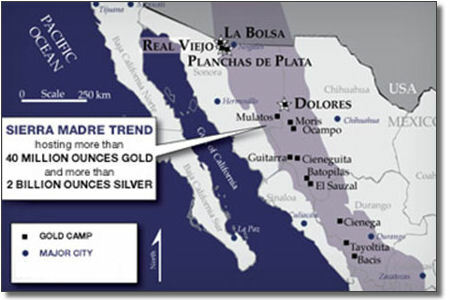 Mexico attracted hundreds of junior exploration companies during the high price cycle of 2010-2011, mostly focused on gold and silver, and ended up with a larger ratio of exploration to development spending as could be observed in other countries and this has lead to a lot of new discoveries. For small junior companies, Mexico has become a "go to" place to explore. According to a report published by SNL Metals & Mining 2015, Mexico is the first destination in mining exploration within Latin America and the fourth worldwide. 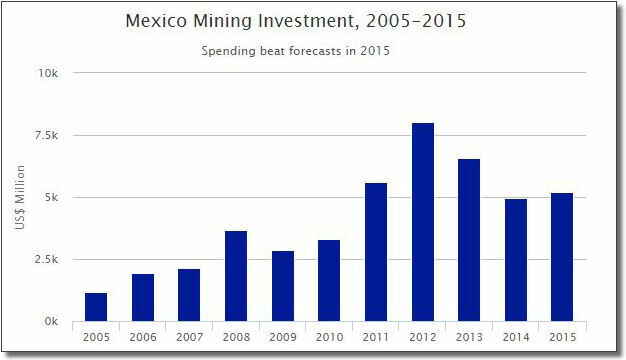 Since 2003, Mexico's aggregate exploration spending grew faster than the world average moving Mexico from eight to fourth place on the global mining ranks. Much of this growth was attributed to Canadian-based junior exploration companies, making up between 75%-80% of the active explorers in Mexico. Other items that have helped is mining regulations and laws. Newer legislation encourages investments in the sector. The 1993 Mining Law (Ley Minera) opened up new areas to foreign investment previously limited to Mexican financing. Permitting for mines has been simplified and obtaining mining licences are quick. The time ttypically takes between 6-8 months for a licence to be granted as opposed to North America it can take between 5-10 years. Lower labor cost have also helped with getting a lot of exploration started along with a very moderate weather climate. The Ministry of Economy's Mining Promotion Trust is another key player. In 2009 this trust helped capitalize micro, small and medium-sized mining companies as well as the sector's production chain with loans worth 510 million USD, 20% higher than in 2008, in addition to offering training and technical assistance to more than 8,000 companies. Of all Canadian companies that go to Mexico to explore, Mammoth Resources is one of those companies that is taking advantage of all the benefits that Mexico has to offer. Having property within the Sierra Madre region in the state of Chihuahua, this company is about to embark on it's first ever drill program starting in the fourth quarter of 2017. Having property in the same trend as the third largest silver mine in Mexico, the Palmarego Mine owned by Coeur Mining, this property holds a lot of potential. Also in this same trend, sits the Pan American Delores Mine. This mine produced 4.3 million ounces of silver and approximately 79,100 ounces of gold in 2015. By the way, the Palmarego Mine owned by Coeur produced 65 million ounces of silver and 71 million ounces of gold in 2015. Investing in any exploration play has it's uncertainties, but going into an area of proven resources with a miner friendly enviroment can take some of the edge off those uncertain risks. This silver play will be a very interesting one to watch. Once drilling begins and results start to prove up a resource, other juniors will be more than eager to get into the rush.